Oooh! Ahhh! What might someone use this for? Robots we can torture, obviously! (As illustrated by the fantastic Sci-ence comic blog.) Because I’m working on flexible electronics, my mind goes straight to consumer gadgets too. This sort of material is the sort of thing you bet Apple or Samsung would pay a pretty penny for once they eventually get the roll-up foldable tablet computers into the hands of folks with little kids who would like to pull on them. Or dogs. Not kids pulling dogs, but dogs pulling things, 21st century edition: The Dog Ate My Transparent Rolled Up Data Pad. But not with this baby. Just stick the halves back together, hold for a few seconds, and voila! Good as new, according to the data here. I can see the B-roll on the late night commercials now. The “skin” part of the work comes from the fact that the material is also pressure sensitive. As a number of folks have pointed out, that could really benefit materials for high tech prostheses too. 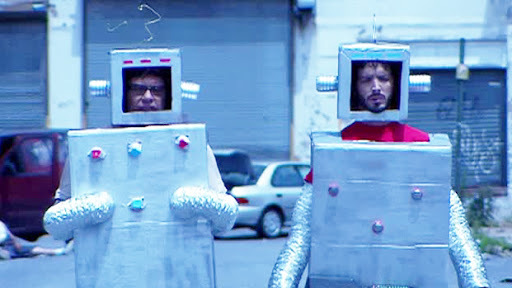 Look at these poor robots, with their tough and rigid skin. So last century. It’s also worth mentioning that the conductive part of the skin comes from microscopic nickel particles. Nickel, of course, being the winner of the much under-reported “Allergen of the Year” award in 2008. I can’t see that being an issue for our eventual self-repairing soft-skinned android overlords. This entry was posted in materials, whoah. Bookmark the permalink. ← Chemistry of Materials, we have arrived!